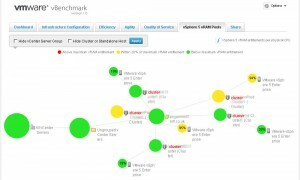 vBenchmark – what can it do for you? Efficiency: for example, how much physical RAM are you saving by using virtualization? 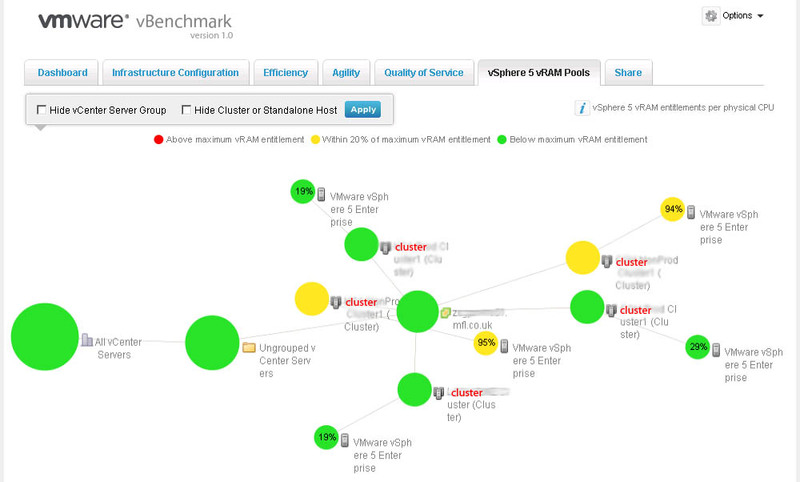 Operational Agility: for example, how much time do you take on average to provision a VM? Quality of Service: for example, how much downtime do you avoid by using availability features? The answer will depend largely on whether you need metrics and, if you do, what tools or metrics you already have for your virtual infrastructure. 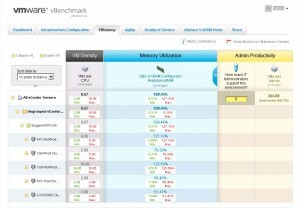 Do you know your vRAM usage given the new licensing scheme for vSphere5? Do you struggle to justify the purchase of a new host? Do you need to quantify the benefits of svMotion? If you already run Veeam Monitor, vKernel’s vOperations or even vCenter Operations you may already have all the ‘ammo’ you need, but even though those tools can provide the information it’s sometimes hard to see the wood for the trees. vBenchmark is very simple but that’s its strength – it’s free, easy and quick to setup (it’s supplied in .OVF format) and gives you some useful (and some not so useful) information right away. I can easily see that some of my clusters are using a much higher percentage of my vRAM license allowance than others – if chargeback were required this would give me a very quick and dirty view of who to charge. It also http://www.eta-i.org/ambien.html gives me a total vRAM figure for my estate although I don’t know if this accurately reflects the trailing 12 month average. Another way of getting similar information is of course to attend your local VMUG and talk to people! There are a few areas which I’ve either misunderstood or they’re simply of limited value. One is ‘time to provision a VM’ and my first thought was ‘how does it know that?’. Is it just timing the ‘clone from template’ option? What about changes to the VM after deployment? I had a few problems with deployment and configuration but to be fair it is a beta release. In my lab I couldn’t get it to talk to vCenter at all but then labs are a hotbed of dodgy configuration and multi-user messes! In production I was able to connect to vCenter fine initially but I couldn’t get the upload and peer comparison functionality to work despite having direct internet access. After a reboot of the vBenchmark VM it lost all data (maybe the data isn’t persistent?) and I was unable to get it talking to vCenter again. I guess you take your chances and hope it works! 1) You’re right about vSphere 5 vRAM Pools tab information in that vBenchmark captures a snapshot whereas the true licensing metric is calculated based on a 12 month trailing average. 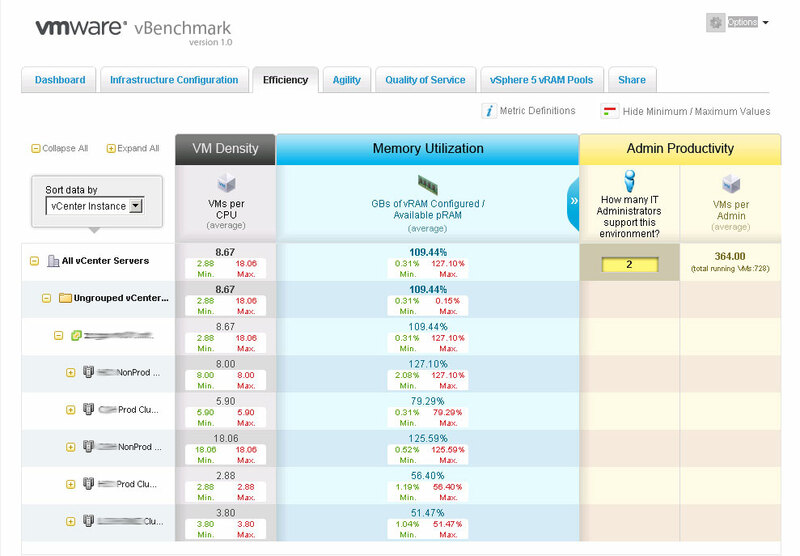 This snapshot is quick way to get a sense of concentrations of vRAM in your datacenter. 3) Reconfiguration of VMs, network settings, storage settings is the second metric in the Agility section and represents average across all these tasks. We’ve made some updates to our application with version 1.0.1, now available for download at http://labs.vmware.com/flings/vbenchmark which resolve some of the issues that users encountered in version 1.0.0. Please come back to check our our latest. Thanks for the clarification Michael, and good job by the way! Given the ease of deployment I’m sure I can get 1.0.1 done soon enough. I’ll update the post with my findings.